Drs. Paley and Feldman have extensive experience in treating a wide range of hip problems, with excellent results. At the Paley Institute, we offer the most technologically advanced treatment methods, with an emphasis on joint reconstruction and preservation over joint replacement. Deformity of the hip joint may be due to femoral deformity and acetabular dysplasia. The acetabulum is the socket-shaped surface of the pelvis where the femoral head sits. Femoral deformity and acetabular dysplasia are often associated with each other. Femoral deformity can be secondary to acetabular dysplasia and vice versa. Deformity of the femur will often cause a resultant deformity in the acetabulum, and a deformity of the acetabulum will cause a resultant deformity in the femur. Furthermore, the shape of the upper femur is affected by any imbalance of muscle forces around it. Deformities of the hip can be divided into coxa valga and coxa vara. Coxa valga is a deformity due to an increase in the angle between the head and neck of the femur and its shaft (normally 135 degrees). 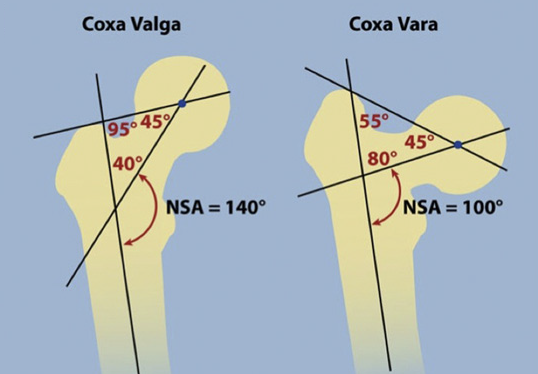 Coxa vara is the opposite: a decreased angle between the head and neck of the femur and its shaft. Coxa vara is usually indicated when the angle is less than 120 degrees. Anteversion of the femur (inward twisting) can create coxa valga. Coxa valga leads to acetabular dysplasia. 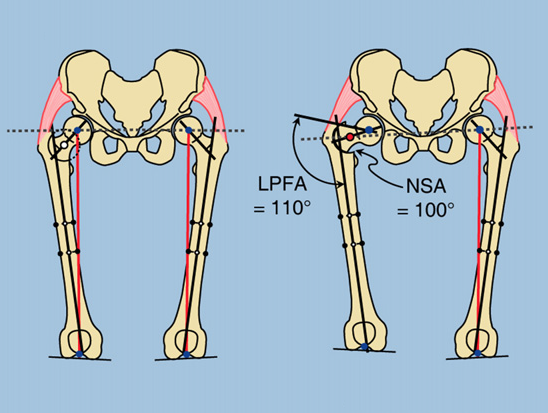 Furthermore, the location of the greater trochanter on an anteverted femur promotes hip dysplasia. Acetabular dysplasia and femoral anteversion are usually associated with one another. 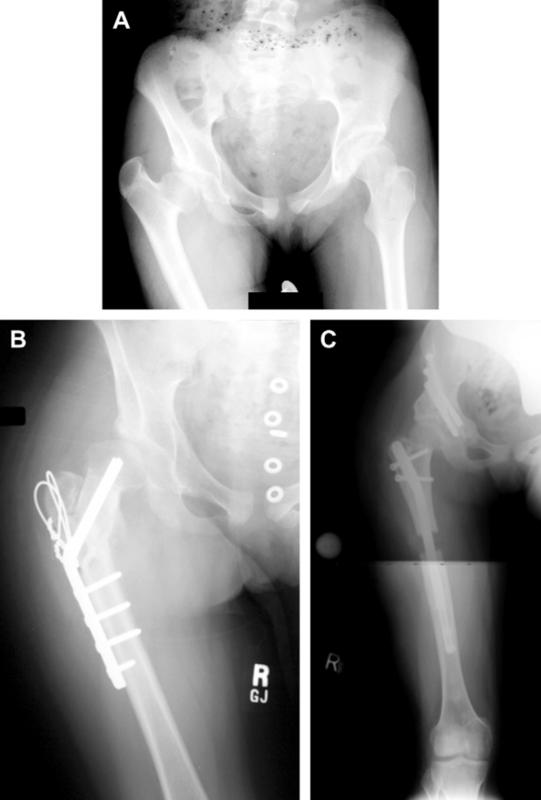 Femoral deformities can also arise after treatment of hip dysplasia. For example, treatment for avascular necrosis can result in growth arrest of the upper femur. This results in further deformity, such as coxa breva (shortening of the neck of the femur) and collapse of the femoral head, resulting in an elliptical or saddle shape. Evaluation of the hip is important for developing treatment strategies. The evaluation will include hip range of motion (ROM), assessment of hip impingement, rotation profile of the femur and tibia, hip flexion and abduction strength, and pain. X-rays provide most of the information needed for diagnosis. Computerized tomography (CT) may be useful to evaluate the shape of the femoral head and acetabulum. Magnetic resonance imaging (MRI) can be used to illustrate the soft tissues and assess impingement. Indications for surgery are based on the patient’s history and physical, x-rays, CT scans, and MRIs. Contraindications for joint replacement include advanced arthrosis and stiffness. When performing osteotomies of the hip joint, it is crucial to consider the surrounding soft tissues. The more extreme and the more chronic a hip deformity, the more likely there are to be associated soft tissue contractures. These must be addressed during surgery with soft tissue releases. In some cases, an osteotomy of the iliac wing of the pelvis is performed to shorten the requisite amount for muscle reattachment. 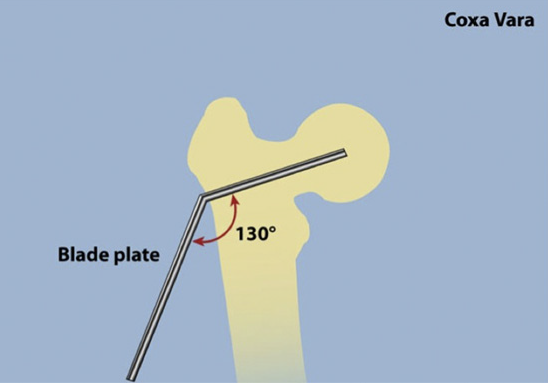 Correction of coxa valga is a varus osteotomy of the femur. The normal NSA of the femur is 130 degrees. 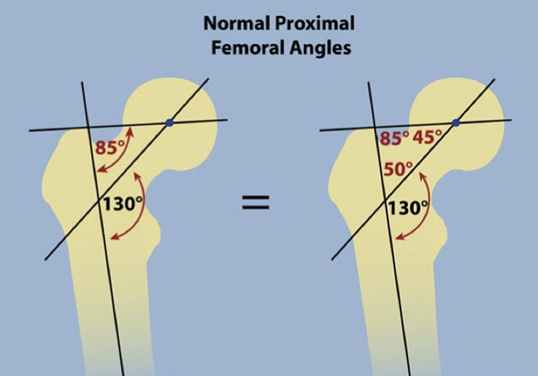 Valgus angles (greater than 135 degrees) put the patient at risk of hip subluxation (dislocation). Treatment involves a pelvic osteotomy combined with varus osteotomy at the upper femur. This will result in good stabilization of the hip. A good example of a femoral varus osteotomy is the Nishio osteotomy. This example demonstrates that hip dysplasia can be corrected with osteotomy of the femur and not a pelvic osteotomy. The Nishio osteotomy at the base of the neck. The osteotomy allows the proximal femur to be turned inwards because it does not elevate the greater trochanter. The greater trochanter is lateralized, increasing abductor lever arm. The femoral osteotomy should be medially translated (towards the inside) to avoid a secondary translation deformity. Furthermore, because varus osteotomy shortens the femur this has an effect on the greater trochanter. There is a risk that the greater trochanter may lose both tension and lever arm, which can lead to a lurch or Trendelenburg gait. 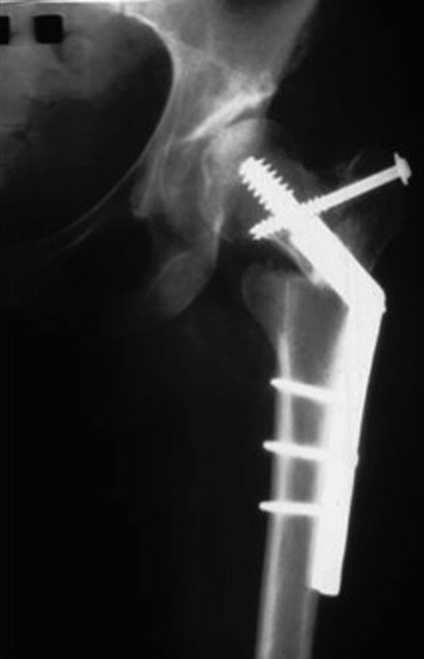 To avoid this, we will transfer the greater trochanter at the same time as the osteotomy. Correction of coxa vara is a valgus osteotomy. Coxa vara results from previous treatment or a congenital deformity. The center of rotation of angulation (CORA) is at the center of the femoral head. Therefore, valgus osteotomy needs to translate laterally (towards the outside) to avoid developing a translation deformity. Coxa vara is often associated with other deformities, such as flexion and rotation. Correction of the deformity often requires correction in all three planes. Because of this, consideration of the muscles of the hip and upper femur is crucial to avoid developing further complications. Our approach is to perform the osteotomy distal (down) to the lesser trochanter to minimize tension on the psoas tendon. The greater trochanter is then moved distally (downward) increasing tension on the hip abductors and increasing abductor lever arm. The osteotomy is stabilized with blade plate internal fixation. This method offers excellent control of the osteotomy. We developed a method called fixator-assisted nailing in which the deformity is first stabilized with an external fixator, and then with internal fixation. The external fixator pins are placed outside the path of the planned nail. The osteotomy is performed and the bone corrected to the desired position. The internal nail is then applied and locked into place. The osteotomy is performed at the base of the lesser trochanter. Lateral translation occurs by lining up the blade plate along the femur. The blade plate is then secured into place. Trochanteric overgrowth is assessed by comparing the medial proximal femoral angle (MPFA) to the neck shaft angle (NSA) of both hips. If the differences are the same, there is no trochanteric overgrowth; if they are different, then trochanteric overgrowth is present. Each of these approaches has the same underlying goal: to increase the length of the femoral neck. The Wagner osteotomy is used to change the part of the femoral head that is articulating with the acetabulum. The other two osteotomies do not change the part of the femoral head that articulates with the acetabulum. The main indication is improved congruity and reduction of joint forces when the femoral head is not spherical. The approach is really two osteotomies: the first is the valgus lateral translation osteotomy that reorients the femoral neck out of varus and lengthens the femur; the second osteotomy is a transfer of the greater trochanter to increase the abductor movement arm. The combination of the two techniques results in increased length of the femoral neck. The Morscher osteotomy does not change the orientation of the femoral head in the acetabulum and therefore the congruity of the hip joint stays the same. The indication is when there is no need to change the congruity of the joint. 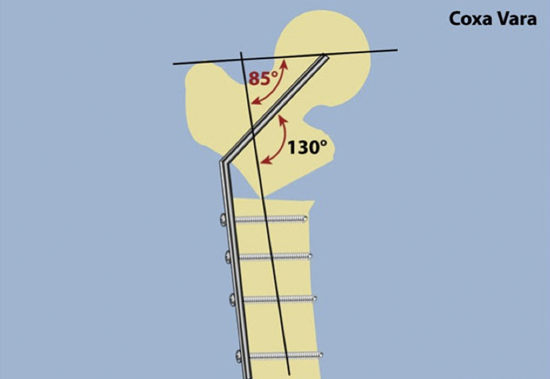 The NSA angle is affected by the femoral osteotomy; a 130 degree osteotomy will result in a 130 degree NSA angle. Next, a greater trochanteric osteotomy is performed to at the same angle and shifted distally (downward) and laterally (to the outside). The effect is to lengthen the femoral neck. The Ganz osteotomy is combined with a capsulotomy and a safe-surgical dislocation of the hip. There is less danger to the circulation of the femoral head than with the other two approaches because the dislocation helps avoid injury to the femoral head. A combined intra-articular and extra-articular impingement of the hip is best addressed with this approach. This osteotomy creates a relative lengthening of the femoral neck by shifting the trochanter laterally (to the outside) and distally (downward). The shaft of the femur is not moved laterally, however, a major difference with the Morscher osteotomy. The Ganz osteotomy does not actually lengthen the femur, as the Morscher and Wagner approaches do. Intra-articular deformities of the hip are deformities of the femoral head at its connection to the femoral neck. One example is a deformity of the shape of the femoral head. Intra-articular and extra-articular surgical procedures can be performed to correct intra-articular deformities. One example is the deformity of the femoral head relative to the neck created by a slipped capital femoral epiphysis can be treated by an intra-articular reduction or osteotomy or an extra-articular reorientation osteotomy. Another example is a non-spherical femoral head can be treated by a Ganz femoral head reduction osteotomy (FHRO). In summary, a customized à la carte approach to surgery makes the most sense for the treatment of the wide range of hip deformities. At the Paley Institute, our approach is to normalize the anatomy and muscle forces while preserving the original anatomic structures. This approach has yielded excellent results, extending the life of the hip for our patients while addressing their pain and disability.